NextThe Peacock, worshipped and revered around the world, and not just because he is a showoff. The peacock has a long history of being worshipped as a pagan deity or used as a symbol by royalty and the wealthy. Its use in the art of medieval Europe was also largely symbolic and generally related to Christianity. 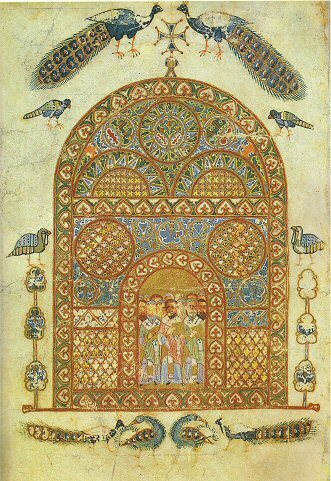 It is from this Christian perspective and interest in Byzantine art that the image of the peacock first appealed to this author. Adorning the floor and wall mosaics of many surviving Christian and Byzantine churches, you are instantly struck by the peacocks vibrant colors and beauty, in particular its ‘all seeing eye’ feathers. The peacock was not always a recognised Christian symbol, its roots first lay across in the east in India. As the revered nature of the bird developed through many ancient cultures, Christians began to borrow elements of stories to suit their own needs. The Aristotelian notion that the peacocks flesh never decayed was borrowed heavily by Christian to associate it with Christ. In Christian mythology, it is believed that the peacock was rewarded for its abstinence because it graciously declined to eat the forbidden fruit in the Garden of Eden. As a result its flesh would never decay after death. In nature, the peacock sheds and replaces his feather every season, and as such, added to the Christian legend of the peacock as a symbol of rebirth and renewal for Christ. The peacock and its brilliant plumage and iridescent tail made it therefore an obvious target for early Christian and Byzantine artists to use. For example, the peacock’s tail feathers fanned out in a ‘halo-like’ position symbolized the divinity of saints, while a solitary tail feather came to symbolize immortality and usually often associated with the Christian martyr Saint Barbara. 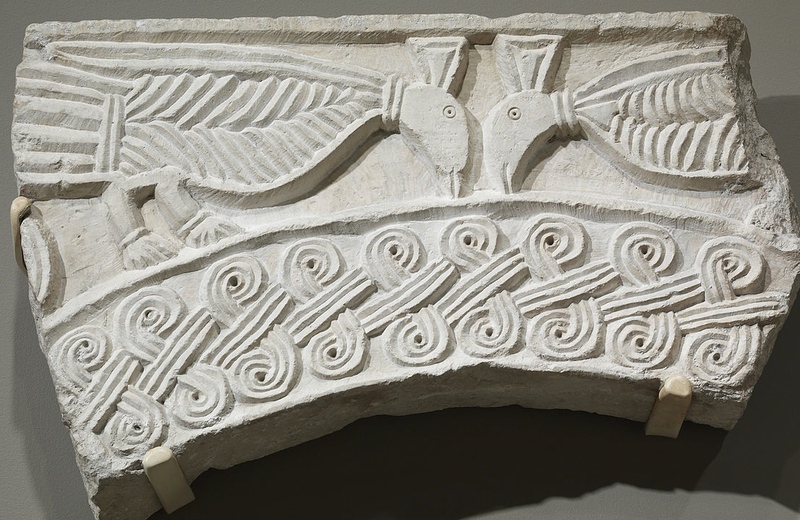 This peacock relief is a fragment of a ciborium. Because of the peacock’s symbolic protective functions, altars and baptismal fonts of churches were often covered by a ciborium, a stone canopy that is supported by columns, featuring the peacock. Importantly, the peacock also features on funerary art because of its symbolism associated with paradise and resurrection . 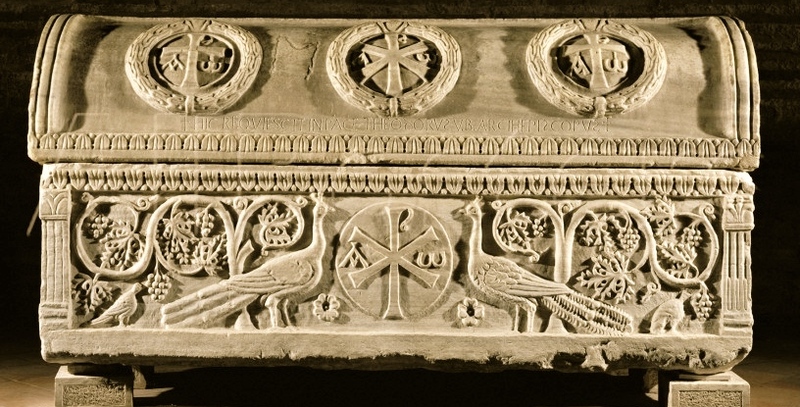 A wonderful example of this is portrayed on Bishop Theodore’s sarcophagus in the right nave of the church of San Apollinare in Classe, Ravenna. On the many surviving floor and wall mosaics of churches today, the peacock is strongly represented. You only have to type in a search result for Byzantine mosaics featuring peacocks and you will be pleasantly surprised by the colour and array of peacock images. Often you will find a single peacock or a pair of peacocks depicted drinking from a chalice or fountain. Its symbolism in scenes like this are associated with spiritual rebirth. 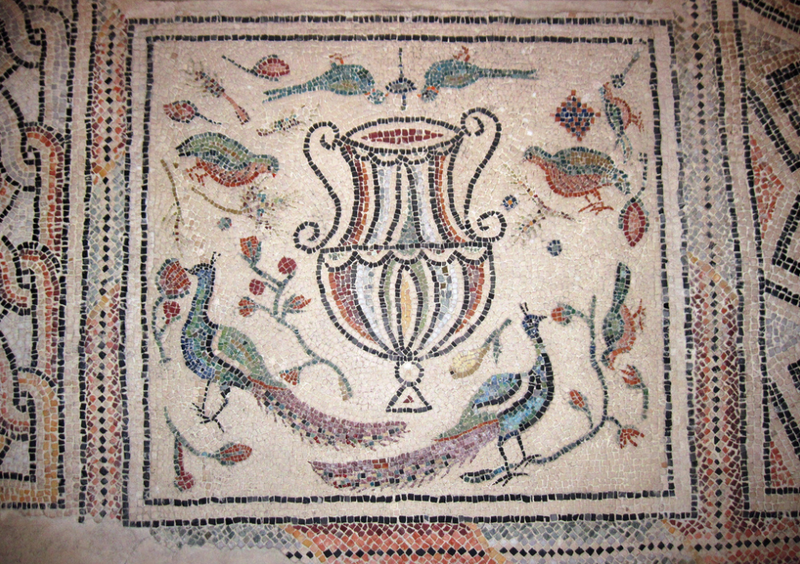 Peacocks and other birds are depicted here with a pitcher on this mosaic floor, 6th century. San Vitale Basillica, Ravenna, Italy. 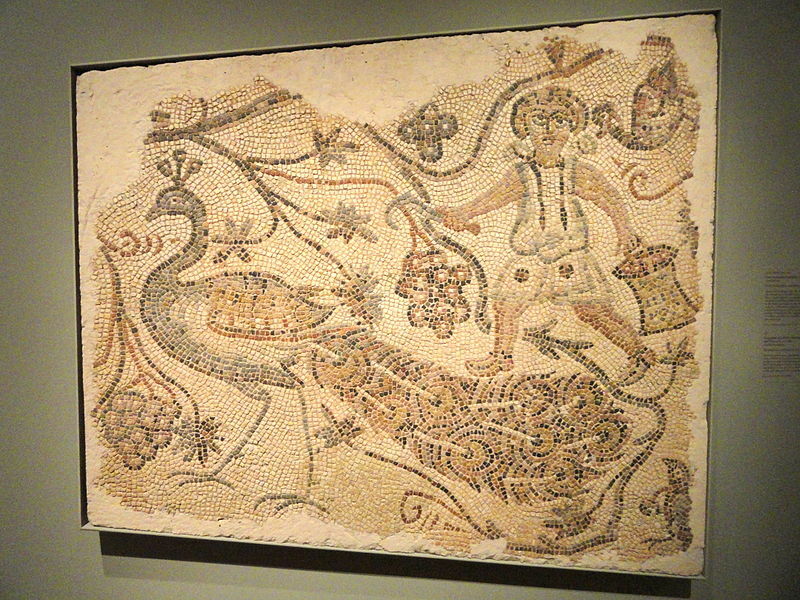 Fragment of a Floor Mosaic, Grape Harvester and Peacock, circa 400s AD, Northern Syria. 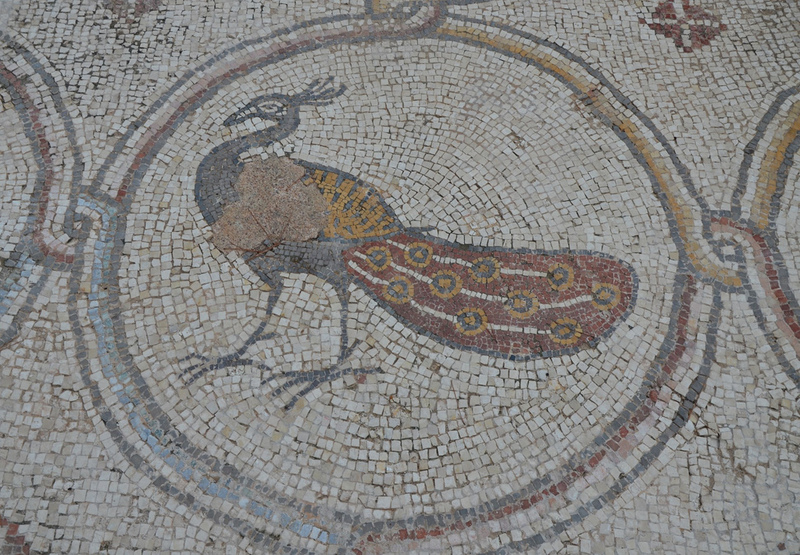 This peacock mosaic adorned what was once the atrium of a large palace complex outside the city wall of Byzantine Caesarea, 6th century AD. It is finally worth noting that apart from adorning the walls and floors of mosaics in churches, medieval Christian manuscripts, both western and Byzantine, were often decorated with beautiful illustration of varies birds including peacocks with meticulous detail. Some were accurately drawn, but most were generally stylized for effective. The miniature of Christian authors, from the Izbornik Sviatoslava of 1073 (below), is a wonderful example of the typical work carried out by Byzantine artists. It was originally made for Iziaslav Yaroslavich, the prince of Kiev. However it is named for his brother, who ousted him from Kiev in 1073, shortly after the manuscripts completion. Sviatoslav’s miscellany featuring varies birds and peacocks. Related article by this author: The peacock, worshipped and revered around the world, not just because he is a showoff!